A multitude of plugins for displaying Instagram images on websites have been released since the launching of Instagram. If you’re looking for the best Instagram Gallery plugin or widget to increase user engagement and to improve your site’s content, this selection is the very thing for you. What is the world’s number 1 plugin? BONUS: Free demo version of the best Instagram gallery! How were the plugins picked? A huge range of free and commercial products is available from numerous web-developers. 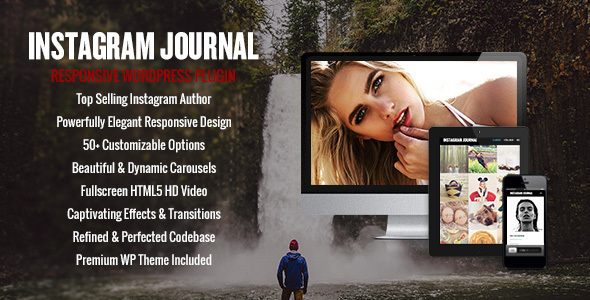 To help you, we have examined all the premium Instagram plugins from the CodeCanyon marketplace. 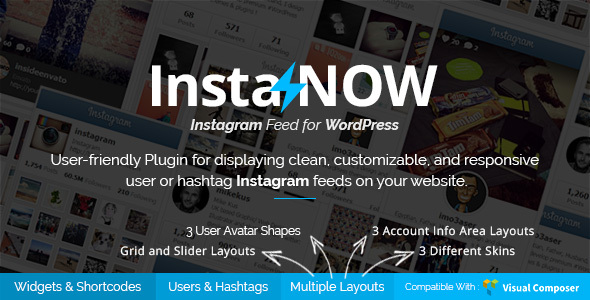 The most popular Instagram plugins with the best ratings and most reviews and downloads have made it to this selection. The average rating of InstaShow is 4.93 based on 165 reviews. The option of filtering the content by such parameters as username, hashtag, location or post URL is available. InstaShow has one flexible layout with 12 options that offer in-depth customization to give it the look you need (navigation and animation parameters, direction, auto scrolling of images, etc). 24 options and 10 predefined color schemes are available for interface customization. The plugin allows you to open the images in a popup window, and displays the complete image information available on Instagram. This allows you to use it both as a gallery and as an interactive portfolio. Support response time is 1 business day. And all this is just for $19. You can check out this plugin on the demo page. It also allows to use 2 types of layouts – gallery and card. Design customization is limited to a range of color schemes. Most of the image information is hidden, and you will need to go to Instagram to view it, while account details are fully displayed in the card layout. The highest rating of 4.95 on CodeCanyon. 1 flexible layout is embedded into InstaLink. This layout can be presented as a gallery or Instagram card. 12 different options are available to the user for customizing the plugin’s look and feel. InstaLink can display the necessary account information in the widget’s header, and the image data is available after the redirection to Instagram. Support response time is 1 business day. And also features predefined layouts to display pictures as vertical blocks of images, descriptions and hashtags. Predefined color schemes allow for website customization. The plugin also has an adaptive layout. Account and image information is displayed next to the gallery, and not in the popup window, what creates certain limitations for the plugin’s use. The indicated support response time is 1 business day. 9 photo filter effects for Instagram images. Instagram Portfolio is another young 1.5-year-old plugin, with a low rating of 4.47 and 475 sales. It allows to display the Instagram feed by username, hashtag, and location, and also features animation and color effects. One of its trademarks is applying filters to images, and downloading images from the popup window. Content is displayed in grids of different sizes, allowing it to be placed in a footer or a sidebar. Part of the account information is displayed with the feed, but to see the image data the user will have to leave your site and go to Instagram. The oldest Instagram plugin created in 2011. Instagram gallery is the oldest plugin in our rating. It has been created 4 years ago, and it is still supported by the author. However, users haven’t been too appreciative of it. This fact is demonstrated by the average rating of 3.92 and only 461 sales over the whole period of time. This plugin can display photographs by hashtag and user, and also features two color schemes (dark and light), and several simple animation effects. Popup displays full image data, but to get the account data you will have to go to Instagram. InstaNOW – despite its age (2 years old) and a rather high rating of 4.76, it’s got a low number of sales – 455. The plugin allows you to work with 2 sources: username or hashtag, and also to display images in a grid, or as an Instagram card or a slider. Several predefined skins and adaptiveness for different solutions allow you to install the gallery to any area of your website. The InstaNOW plugin displays the Instagram account information in grid and card layouts, in the other layouts you will need to click on an image to open a popup with the image data (author, likes counter, hashtags). The last update of the plugin was released in 2013. 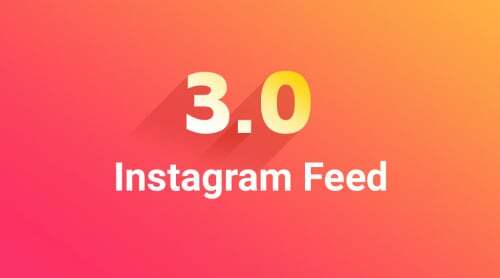 Instagram social roll, the last plugin on this review has been created in March 2013, and it was updated by the author for the last time in the same year. It’s got the lowest rating on our review – 3.71, and the least number of downloads – 166. This plugin can display Instagram feed from 2 sources: username and hashtag, and also separate photo and video content in the feed. The only information displayed is the image description, which makes it possible to use this plugin only as an interactive element. The summary of the reviewed plugins. The data presented in it is the actual data on November 21, 2016, when it has been collected. So what is the number one Instagram plugin? 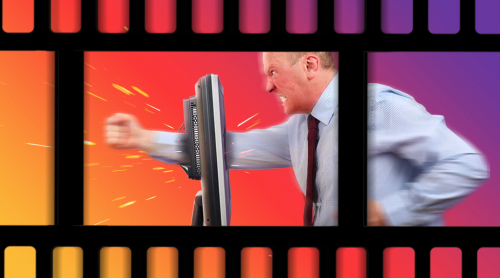 We hope that you enjoy our review and find it useful when selecting a plugin. 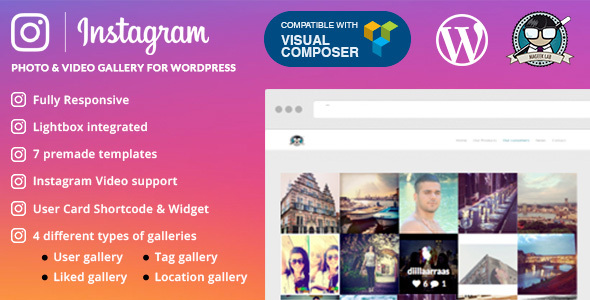 Our choice of the best Instagram plugin coincides with that of CodeCanyon users’. We would love to know your opinion. Comment on the choice of the winner, or leave your own review on one of the plugins from the list. We’re looking forward to your feedback, thank you! Test all the benefits and shape a cool Instagram Feed for your website.